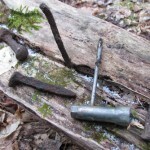 Tales of exploring logging railroads of central Pennsylvania. On November 14th, Vince made his first visit in quite some time. Our goal was to survey my theorized Great Circle Route, and perhaps log mileage on some other projects, despite pretty damp weather the night before. We started by dropping Vince’s truck on Stillhouse Hollow Rd and driving to Faust Valley Trail and Sand Mtn Rd. I showed Vince the suspicious areas in the driveway of the camp there. Visibility was better with brush and weeds down, and he gave it a thumbs up. 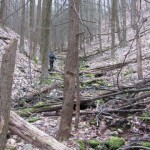 We followed it up over the hump towards the headwaters of Lingle Stream, with fair confidence, until it comes out onto the road/trail near a large clearing. 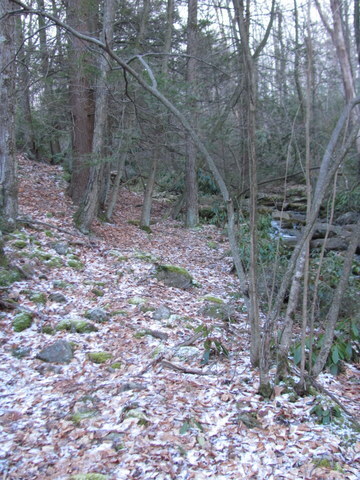 We then headed out the road and onto the overgrown trail portion beyond the point where Ground Oak Tr diverges. 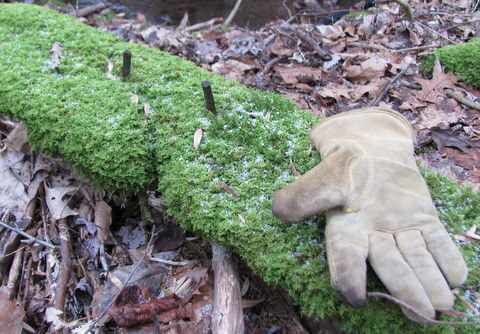 The first stretch is intermittently very swampy, but we had no luck finding bridge timbers or similar items. 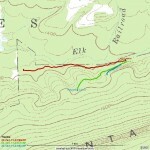 However the route seemed generally plausible, despite some large boulders. 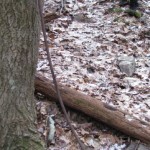 After a bit the the trail petered out and the rainsoaked brush became even thicker. But under it a RoW seemed quite obvious. We followed it intermittently for a considerable distance, becoming thoroughly soaked in the process, until eventually a clear woods road begins again. From there on, we surveyed the road as the assumed route, as there really isn’t much room between the road and stream in that area. 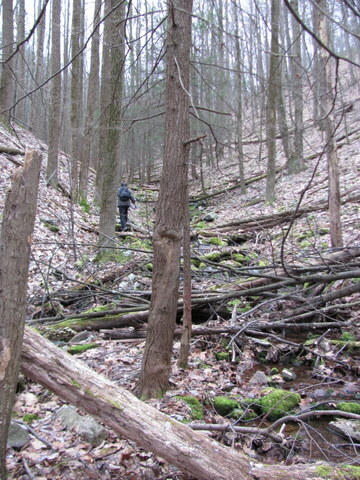 Eventually I pointed out the stream crossing where the broken rail had been found. 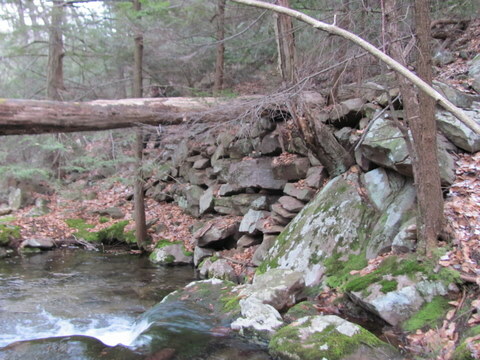 From that point on, we assumed the RoW was on the south side of the stream and tried to follow it. Unfortunately, some of the evidence I thought I saw in the summer (with lower water levels) was not visible, and the route is vague for quite a distance. Eventually, in the vicinity of the well kept camp (see previous post), it does seem fairly clear that the RoW was on a ledge near the stream. A significant stream crossing has to be inferred at one point, and then, bingo! we are at the cut mentioned in the previous post which started all this nonsense, and at Vince’s truck. An easy water-level route, some clear signs of RoW, I call it a success! 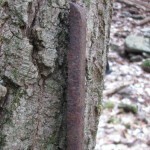 We stopped in at the camp to say hello, and I showed Vince the piece of logging railroad rail. That got a thumbs up as well. We returned to Faust Valley Trail and Sand Mtn Rd, and surveyed in the vicinity of the camp on the north side of the road (Sand Mtn camp, maybe?). RoW is clear for some distance there, before it plunges into a brutal stand of white pine. We skirted the thicket by heading onto the road to the nearby group camping area. Taking the trail north of the campsite, we again picked up the RoW and began following it NE, with clear tie depressions for validation. After a modest distance we lost it in a logged-over area. 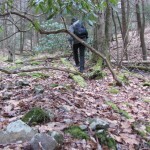 This is the same fern-cursed area off Old Sand Mtn Rd that we explored ages ago with no luck. We ultimately got onto OSM Rd and followed it past the camp, noting the many limbs down from this year’s early snowfall which occurred while leaves were still on trees. A bit past the camp, Vince hailed “got it!” and lo and behold we had beautifully clear rock right of way paralleling the road. We surveyed it for a fair distance, only intermittently disrupted by deer fences and their access roads. Grrr, there oughta be a law! 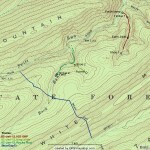 For a good stretch, the route is on the north side of Big Poe Creek. Eventually it switches to the south side. And, curiously, the clear rock roadbed just sorta… dies. This stretch was obviously nothing but tramroad. 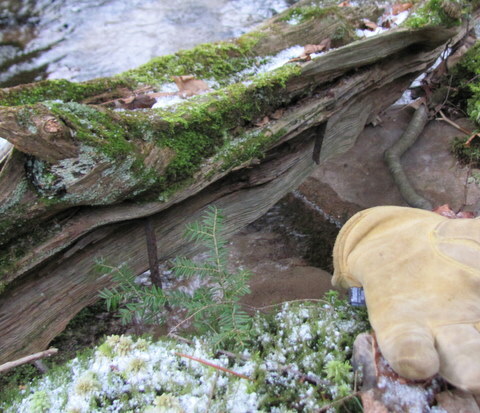 Numerous times we thought we’d lost it, only to finally stumble upon evidence of parallel logs, or occasionally clear bridge timbers in wet areas. Thankfully it follows a pretty straight line in this portion, but it takes a fairly good scout to follow. Eventually we came out into an area near S-M Pike that we’d explored before (and felt had some suspicious but very vague spots) and found ourselves very near the shuttle truck. 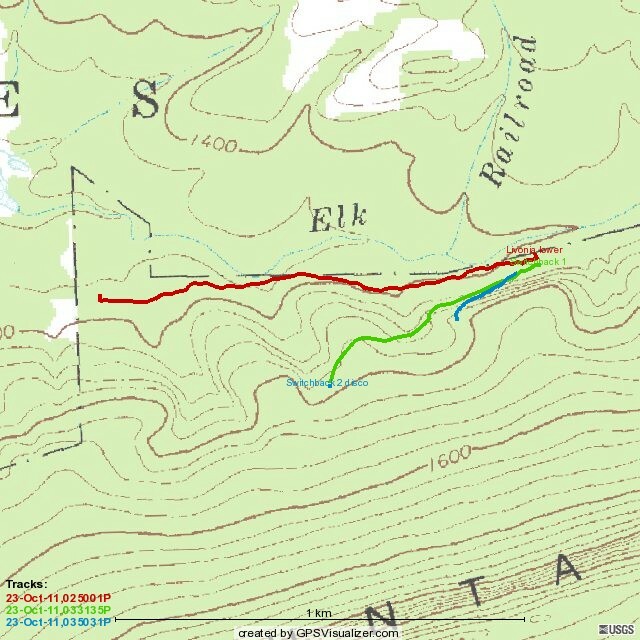 This last stretch (and the Lingle Stream portion for that matter) certainly support the idea that this route was very problematic for Reichley in later years. While some areas were either better built or upgraded, large portions would have been very primitive stuff in the later days of logging railroads. The construction in Green’s Valley (parallel and theoretically newer route) seems far more robust. Our final task for the day was to finish the bit along Big Poe Creek, upstream from the CCC camp, which we ran out of daylight to do. 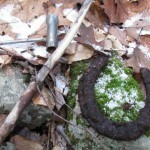 We parked at the CCC camp site along BPC, crossed the stream, and picked up the track again. Skirting a couple of camps with loud partying crowds, we tracked the route out to S-M Pike… and directly into the aforementioned concrete and stone markers. Ha! 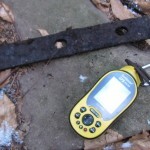 Smartass surveyors. The results combined with our previous survey are shown below. Now that is a piece of railroad! Closing the Great Circle Route? 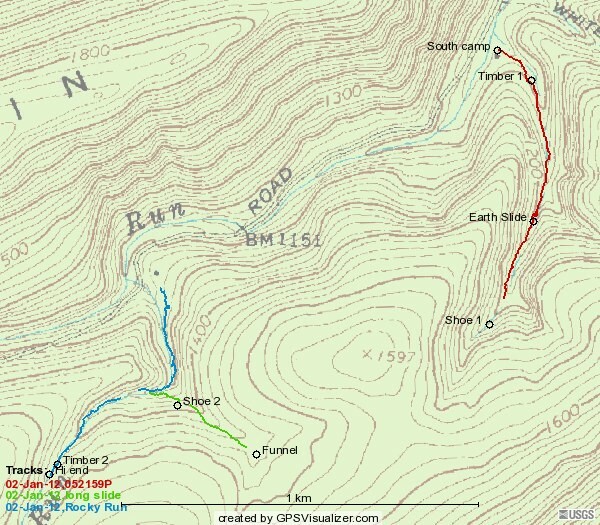 Back in the summer I spent some time seriously pondering what we know about what I call “The Great Circle Route”, the idea that picnic trains were run over a loop track from Milroy [Book 1, p. 135]. I’ve said before that I’m pretty skeptical of Kline’s map [Book 1, p. 132] showing a route past the forestry nursery on Rt 322, which would probably have to go up Decker Valley. I’ve never found a scrap of physical evidence to support the idea. Frustrated, I returned again to perusing maps. Looking at a Maptech historic topo [Centre Hall 1929, cthl29se.jpg] raised an interesting possibility. 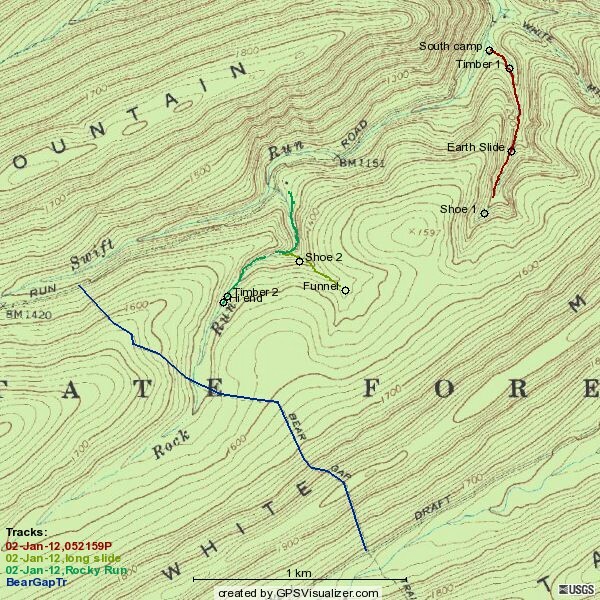 What’s this dashed line continuing from Old Sand Mtn Rd [north of and parallel to present Sand Mtn Rd–see Bald Eagle State Forest map] along Lingle Stream…? It looks like a very easy route. 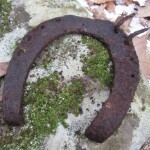 Could that have connected BPC to previous RoW found on Stillhouse Hollow Rd? Field Trip!! This time I started on Stillhouse Hollow Rd. I crossed the stream from the crude parking area downstream from the scout camp lake and almost instantly made an interesting discovery… is this a CUT? 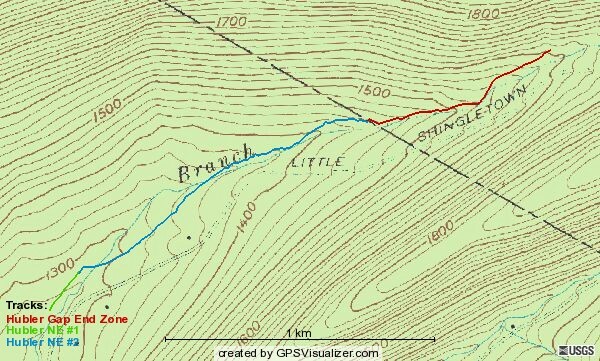 Sure looks like it, and it suggests a branch off the clear route to the scout camp lake, one that would parallel Stillhouse Hollow Rd towards Lingle Valley Stream! 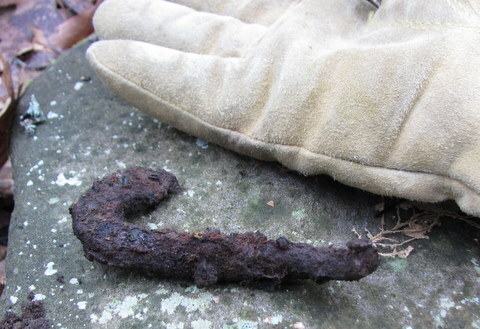 After retrieving my jaw from the ground, we dug around in the leaves and found a piece of genuine logging railroad rail, probably 30 pound size, slightly bent and broken on one end, drilled on the other end. 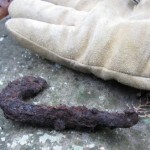 They found it up Lingle Stream from their camp, near what they thought might be a (railroad) stream crossing. 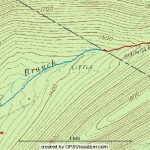 They also said that–although present maps don’t usually show it–there actually is road or trail the whole way along Lingle Stream to Sand Mtn Rd. 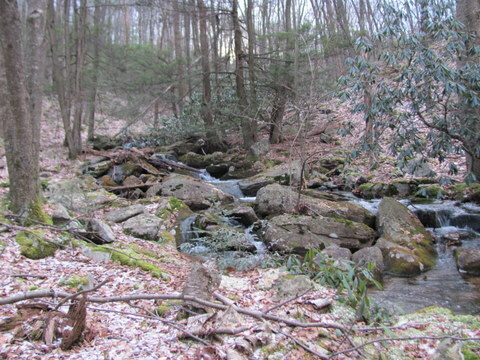 And it’s fairly level and straight its whole way… With their permission, I headed up Lingle Stream for a look. 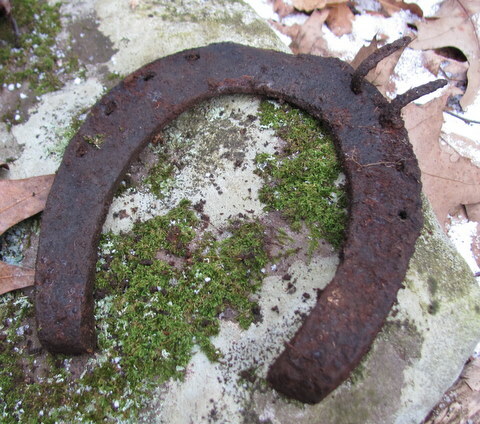 Regretfully, there aren’t a lot of clear signs along Lingle Stream. I kept getting that vague feeling that there might have been something there once, and I think I found their possible stream crossing. 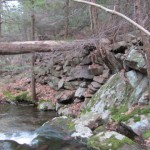 But flooding of the stream has obviously done a lot of damage to the area, and if the son is correct, the railroad might have been on a narrow ledge along the stream at first, and hence badly damaged. As I got further up the stream, I saw what they meant about the road. It’s a very plausible RoW, level and straight, but has been driven enough that any definitely sign is unlikely to be found. Also, I kept telling myself, this was crappy tram road, probably not well ballasted. It was bad enough that Reichley wanted to abandon it, but so how much sign is likely to survive? Eventually I gave up and decided to explore at the far end of Lingle Stream where it reaches Sand Mtn Rd. 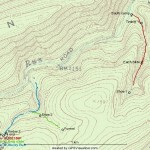 Heading NE on Sand Mtn Rd, I reached Faust Valley Tr and parked at its gate. 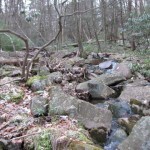 I walked up over the hump towards Lingle Stream’s headwaters. Just on the far side of the hump, I noticed some plausible signs on my right… Nothing major, but definitely suspicious. A bit father on the trail becomes a fairly legitimate road, and despite crashing around in areas near the stream’s headwaters, I couldn’t find anything clear. Eventually the road peters out into an overgrown trail near a spring, and I turned back. Arriving back at the truck, I took a look at the driveway of the camp there (Faust Valley camp? not sure). I recalled that Vince had looked there one time in the distant past and ruled it nothing. But looking at it with newfound optimism it seemed at least as good as the portion over the hump from me. There’s a ledge there, and it ain’t natural. I began to think I was onto something! I wanted to look on the other side of Sand Mtn Rd, but the camp there was overrun with PSU football weekend types, so I decided to go elsewhere. Going just a short distance NE on Sand Mtn Rd, I found a road to the north into a group camping area and parked there. 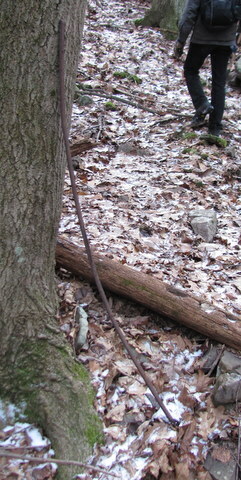 I walked down to the vicinity of the actual camp site and found a trail into the woods to the north. Going just a short distance, maybe 150 feet, I found a slight roadway looking thing at the correct orientation. Following it a very short way to the NE I found gloriously clear tie depressions. Holy crap, I think I’ve closed the Great Circle Route! Wait ’til headquarters hears of this. 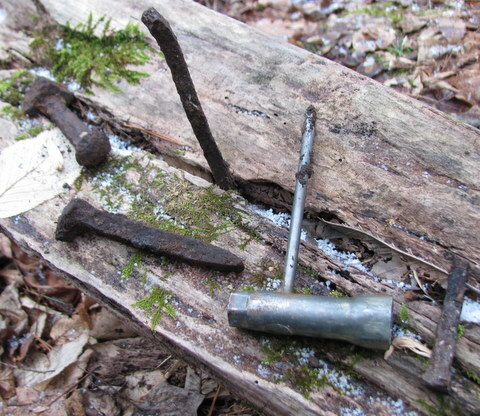 Back in January, I mentioned I had checked out a report from site visitor John Shingler of Poe Valley regarding railroad right of way near the CCC camp location in Poe Valley. Since Vince was departing State College to the east after his visit this weekend, we decided to log some mileage in PV. 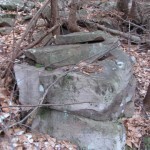 We started at the CCC camp location, which is on Poe Valley Road maybe a mile east of Siglerville-Milheim Pike. We parked on the south of the road and followed the faint road through a stand of pines to the southeast. 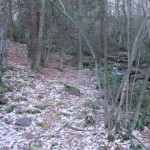 After crossing the stream on the large rocks, we continued a short distance on the road, intersecting road roadbed. After some head scratching, we decided to go southwest first. 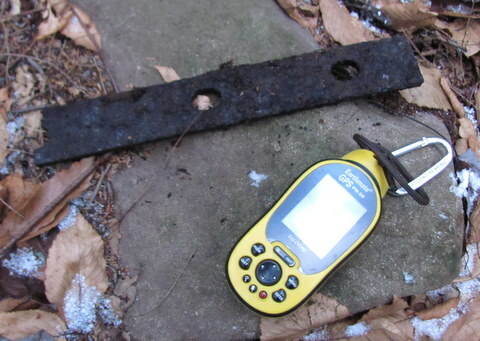 We enjoyed a pretty clear survey, mostly on distinct road roadbed through open pine woods. 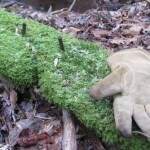 In a few places, recent logging activity or four wheelers have damaged the right of way, but most of it is in good shape. We terminated our trip to the southwest when reaching a driveway accessing a private camp. The right of way obviously continues beyond that point. Returning to our starting point, we resumed surveying to the northeast. Regretfully, after a bit of clear going, the Mtn Laurel began to thicken and we found it necessary to curse it profusely in order to make forward progress. 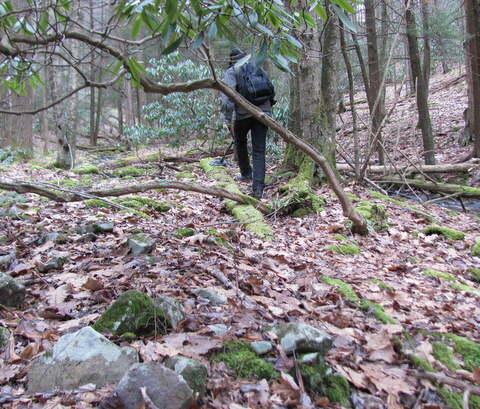 The right of way is mostly clear rock rockbed, though seriously hidden by undergrowth in some places. 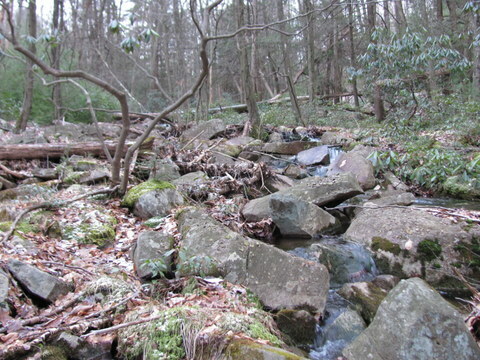 A few areas are built up pretty well to cross minor streams. At one point, we came upon a rather mysterious structure, obviously recently constructed, consisting of telephone poles and boards stuck together in rather bizarre fashion. My theory is that it is an osprey stand, as ospreys are rather bizarre, and they might like its proximity to “good feeshin” at Poe Valley lake. Eventually we came to signs suggesting we were very close to Poe Valley park. 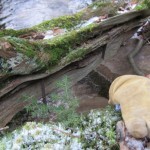 Just as we were about to halt our survey, I noticed a clear switch going off to the NNE, towards the stream. 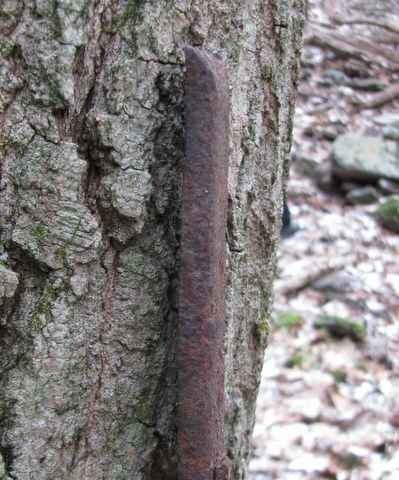 I tried to follow it for a while, but its track quickly fades out… Was this a branch to the other side of the creek, to a sawmill, or just a random siding? We don’t find a lot of sidings, so it was sort of neat to catch this one in an accessible location. 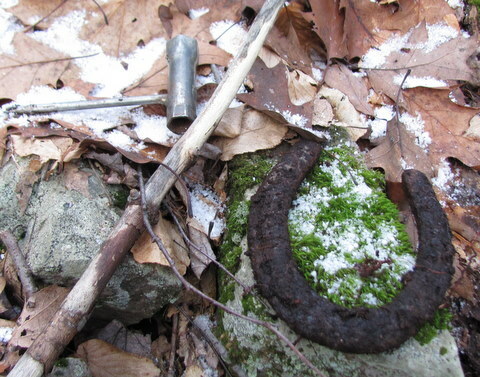 We finished our exploration by checking out some rather strange railroad artifacts (which appear to be 36″ gauge) in proximity to Poe Valley park [No, we do not feel this is the lost locomotive of the Seven Mountains–sorry!] and then examining the (dry) lakebed of the park’s lake, in case there should be visible rock roadbed running down its center. There isn’t. 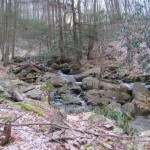 We’ve previously explored this valley further to the NE, but not immediately downstream of the dam. 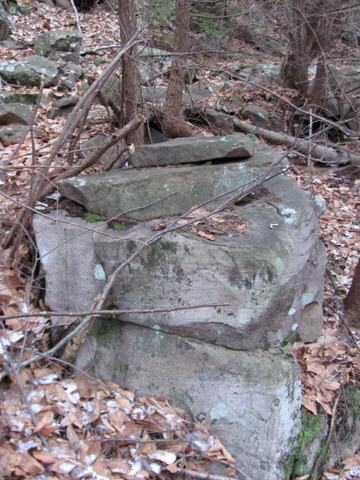 We have a report of a historic marker and visible right of way at the campsite there–we will have to check that out next time we get out hereWe will also try finish this survey out to Siglerville-Milheim Pike.